When folk art came into vogue in the early 20th century, the notion that wealthy art collectors would want to surround themselves with objects made by poor people seemed rather curious. After all, as art had become an increasingly acceptable topic for criticism and academic study during the 18th and 19th centuries, the world of fine art was defined precisely in opposition to that made by and for the unwashed masses. However, a few educated and cosmopolitan individuals saw value in so-called “folk art” as the last vestige of certain rural and working-class ways of life, which were endangered by the financial and social upheavals caused by the Industrial Revolution. Folk art, the catch-all term used by the bourgeois to describe aesthetically enhanced objects produced by those without formal training, was admired as a pure form of expression impossible to learn in art school, a heartfelt connection to a simpler time. Viola and Elie Nadelman were at the forefront of this emerging genre. The Nadelmans were among the first to offer a progressive view of folk-art heritage that bridged the Atlantic, connecting American objects with those made in Western European countries. They were also the first to share their collection of folk-art artifacts with the world, which they did beginning in 1926, when they established the Museum of Folk and Peasant Arts in Riverdale, New York. The institution was a beacon for folk art until 1937, when the Great Depression forced the couple to sell the majority of their collection to the New-York Historical Society. 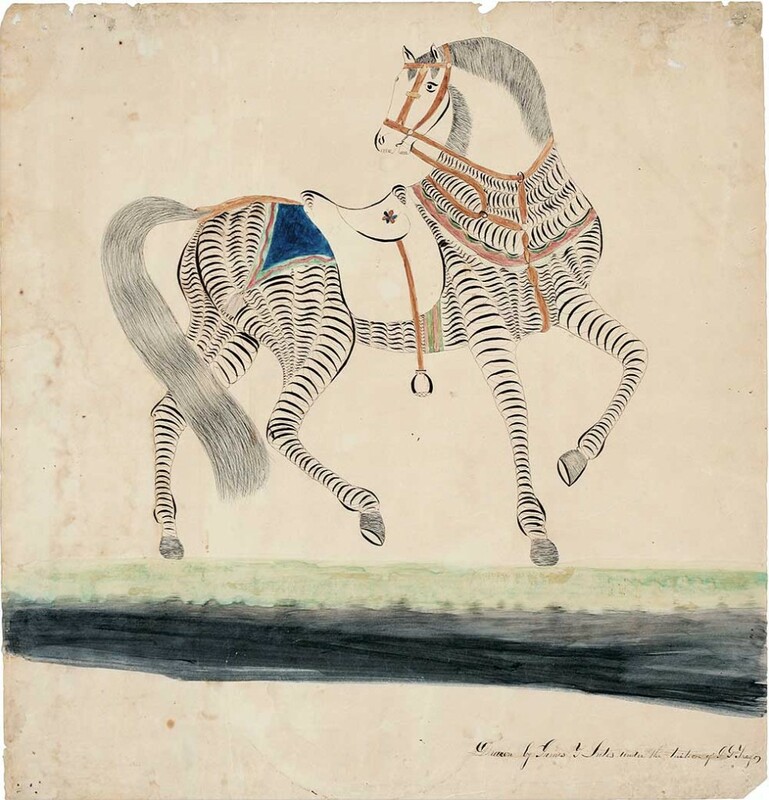 Roberta Olson, the N-YHS’s curator of drawings, and Margaret Hofer, the museum’s director, recently organized a comprehensive study of the renowned collection that became America’s original folk-art museum. 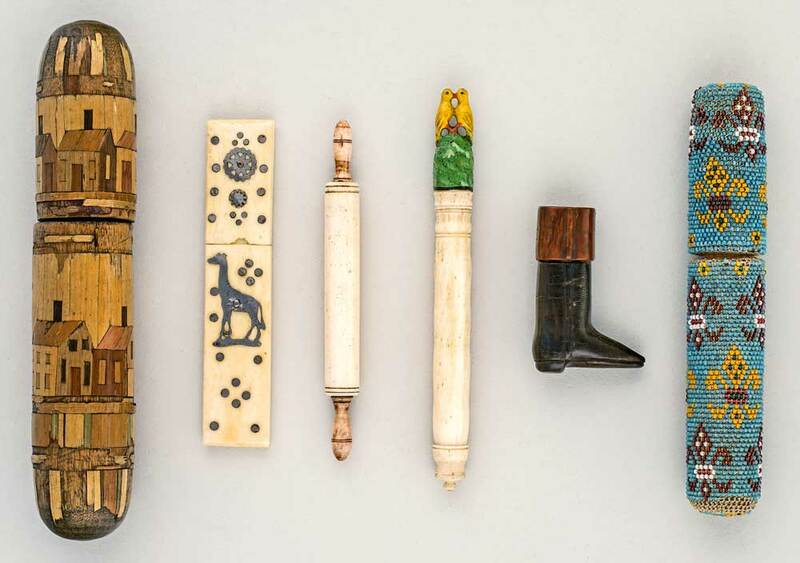 Their exhibition entitled “The Folk Art Collection of Elie and Viola Nadelman,” encompasses objects from the 16th through the 20th centuries and opens at the N-YHS on May 20, 2016. 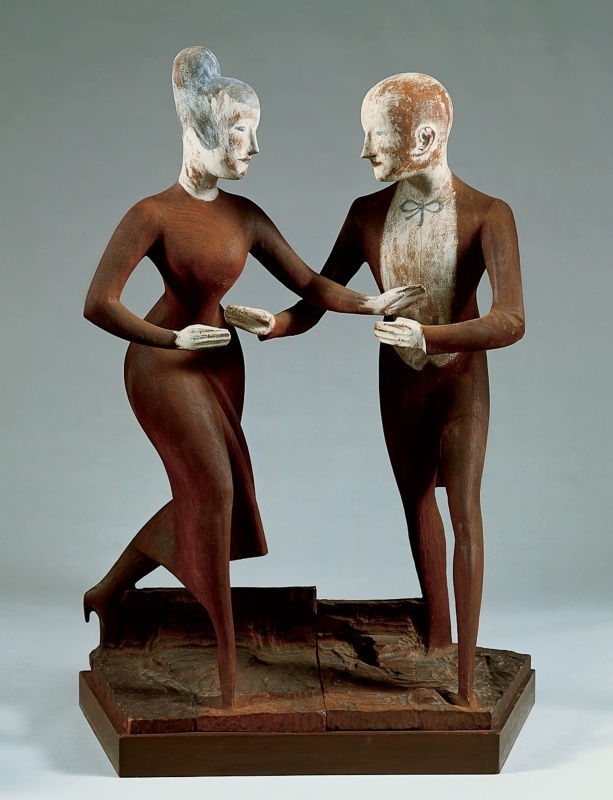 Top: Elie Nadelman’s sculpture “Tango” from the early 1920s was influenced by folk-art craftsmanship. Courtesy the Whitney Museum of American Art, from Making It Modern. Above: Decorative needle cases from the 19th century. From the collection of the New-York Historical Society, photographed by Glenn Castellano. From the early 1920s, the Nadelmans referred to their collection as folk art, after the working-class folk who produced it, although the phrase didn’t come into widespread use for at least another decade. “They were really in the vanguard of all of this, and no one had collected on their scale,” Olson says. “What they called folk art is maybe not what we’d call folk art. It’s a term that’s still hotly debated.” In today’s world, as technology gives the most isolated rural areas access to popular culture and “craft” objects are reproduced on a mass scale, agreement over what falls into the folk-art genre is elusive. But a century ago, a growing interest in folk art helped broaden the notion of what was worthy of aesthetic appreciation and scholarly study. 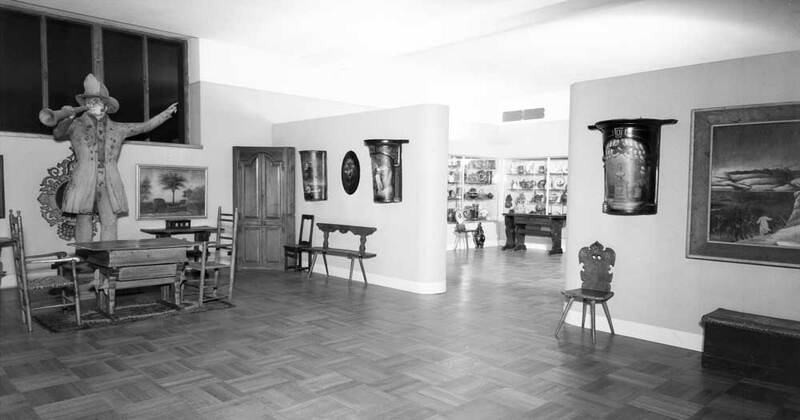 European peasant furniture as seen in Gallery VII at the Museum of Folk and Peasant Arts in 1935. From the Estate of Elie Nadelman. Viola grew up in a wealthy American family of German-Jewish descent, and was involved in the arts as a patron at least since the early 1910s. Around 1917, Viola helped found the Needle and Bobbin Club in New York City, a group that studied, collected, and promoted handmade textiles. She had also built a personal collection, which included traditional wedding fabrics, clothing, samplers, quilts, and rugs. 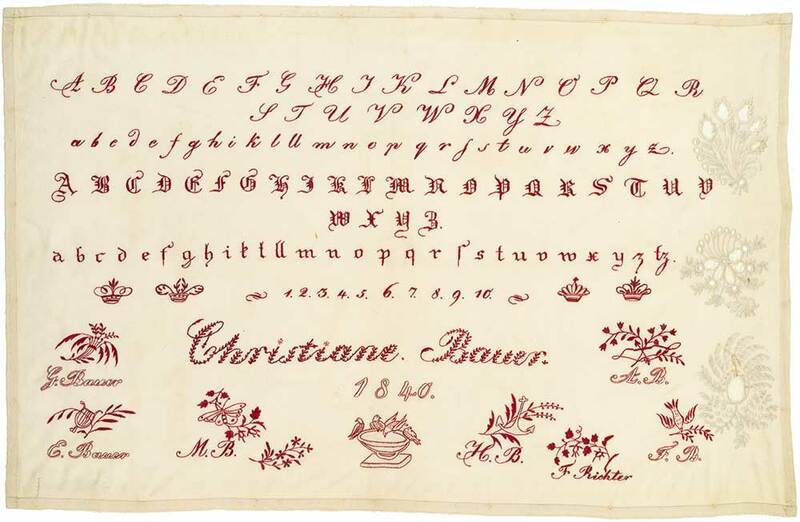 Viola Nadelman previously collected samplers, intended to teach embroidery, like this German example made by Christiane Bauer in 1840. From the collection of the New-York Historical Society, photographed by Glenn Castellano. Elie was raised by his Jewish family in Poland, but traveled to Munich in 1904 as part of his art-school education, and on to Paris after that. In Germany, Elie visited the Bayerisches Nationalmuseum (the Bavarian National Museum), whose collection ranged from classical paintings and sculpture to pottery and wood carvings made by peasants. During his 10 subsequent years living in Paris, Elie became acquainted with the avant-garde art community, including the siblings Gertrude and Leo Stein. In 1914, Elie moved to New York with the help of influential cosmetic magnate and art collector Helena Rubinstein. It’s unknown exactly how Viola and Elie were introduced in New York, but their romance progressed quickly, and the couple was married in late 1919. During their honeymoon, the Nadelmans likely visited the Norsk Folkemuseum in Oslo, founded in 1894 to study traditional Norwegian culture. The museum was one of several nationalist institutions established in Europe during the late 19th century to preserve traditional handcrafts and lifestyles as industrialization began threatening their existence. 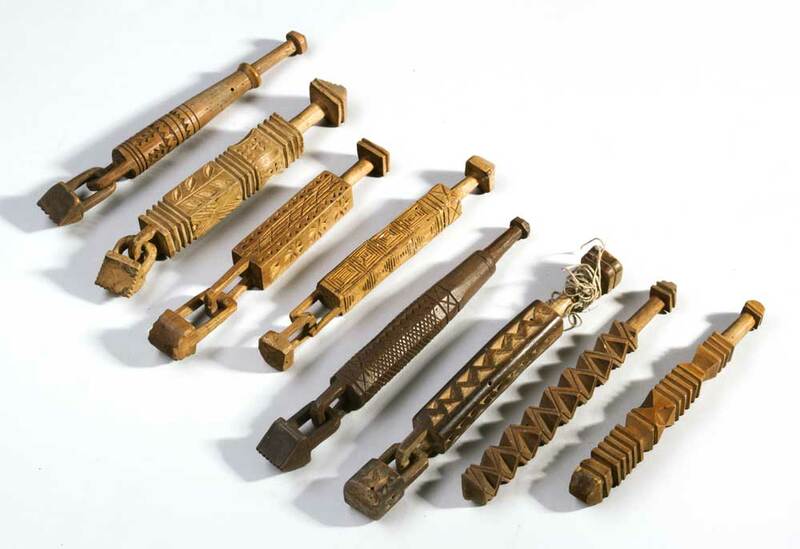 Folk art often denotes utilitarian objects with added decoration or sculptural carving, like these Hungarian lace bobbins from the early 19th century. From the collection of the New-York Historical Society, photographed by Glenn Castellano. “When people started feeling a society or a way of life was disappearing, there were attempts to record them,” Olson says, “and that certainly made a great impression on the Nadelmans. This was part of the larger zeitgeist, of what was happening all over Europe. Picasso was looking at African arts; others, like Gauguin, were looking to Polynesia. People were looking to non-Western cultures for inspiration, as a way of testing aesthetic principles and getting back to something they considered ‘pure.’” The raw authenticity of folk art also inspired Elie’s artwork, such as his wooden sculptures that were sanded, painted, and stained to look as though their smooth surfaces had aged naturally. 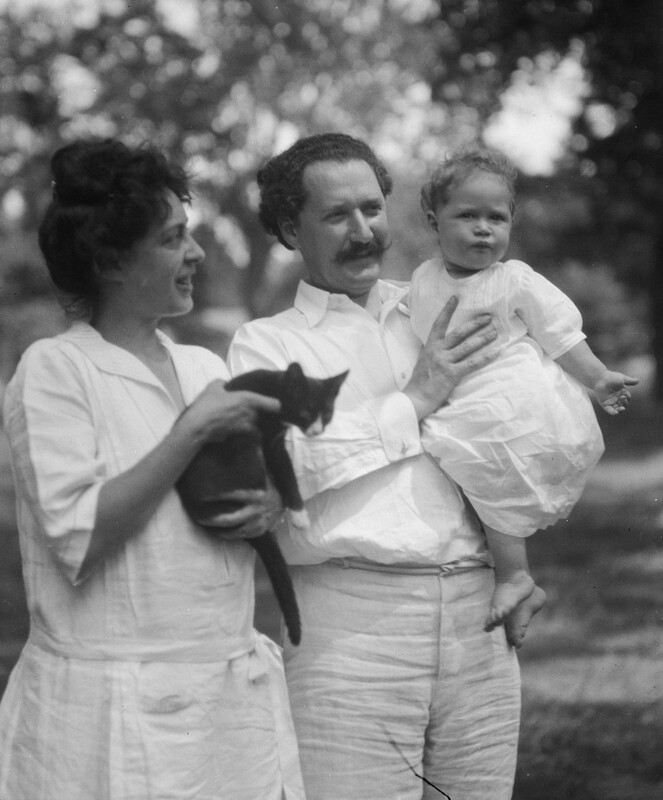 Photographer Arnold Genthe captured this image of Viola and Elie Nadelman with their son Jan in 1923. Courtesy the Library of Congress. With Elie’s success as a professional artist and Viola’s experience as an heiress and socialite, the couple found a common passion in championing European and American folk arts, especially items from the 18th and 19th centuries. What began with antique furniture bought to furnish their townhouse on New York’s Upper East Side and country estate in Riverdale-on-Hudson quickly transformed into a full-fledged obsession as the Nadelmans acquired more and more vernacular objects. 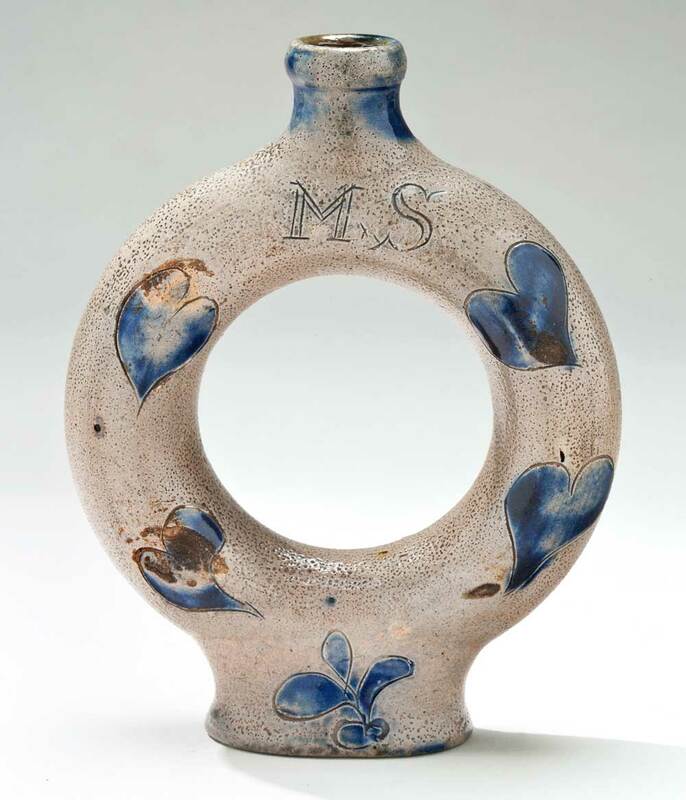 Stoneware ring bottle, circa early 19th century. From the collection of the New-York Historical Society, photographed by Glenn Castellano. 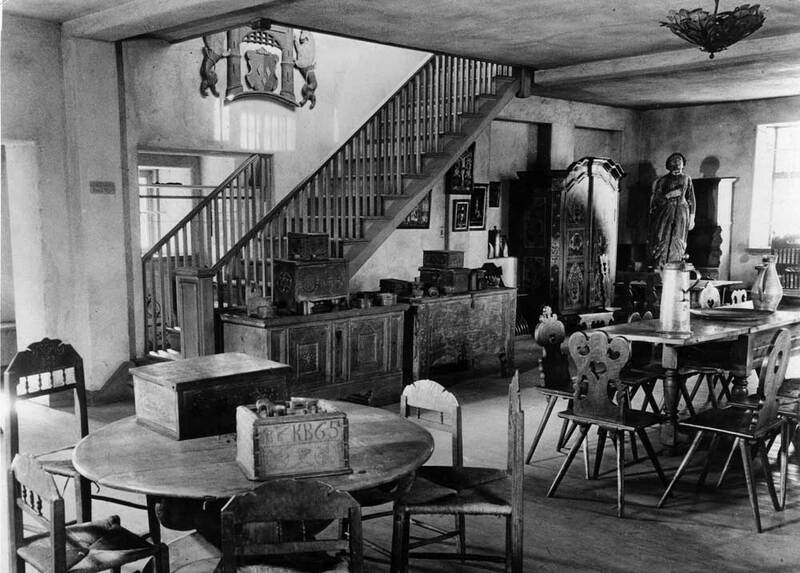 By the early 1920s, the couple had amassed the country’s largest collection of folk art and set out to establish a museum to house their objects. In 1924, they began cataloging their extensive collection and worked with an architect to construct a building for it on their property in Riverdale. The collection kept growing, so rapidly that they expanded the museum’s building before it was even complete. Though some types of folk art, like quilts, were uniquely American, most items—from embroidered samplers to Pennsylvania-German Fraktur drawings to carved wooden advertising figures—could be linked to European forebears. Displays at the MFPA made these connections between the two continents’ art forms explicit, with objects ranging from 11th-century Romanesque sculpture to 20th-century American dolls. Viola and Elie had even purchased and installed two antique apothecary interiors, one American and one French, in order to emphasize the cultural overlaps. 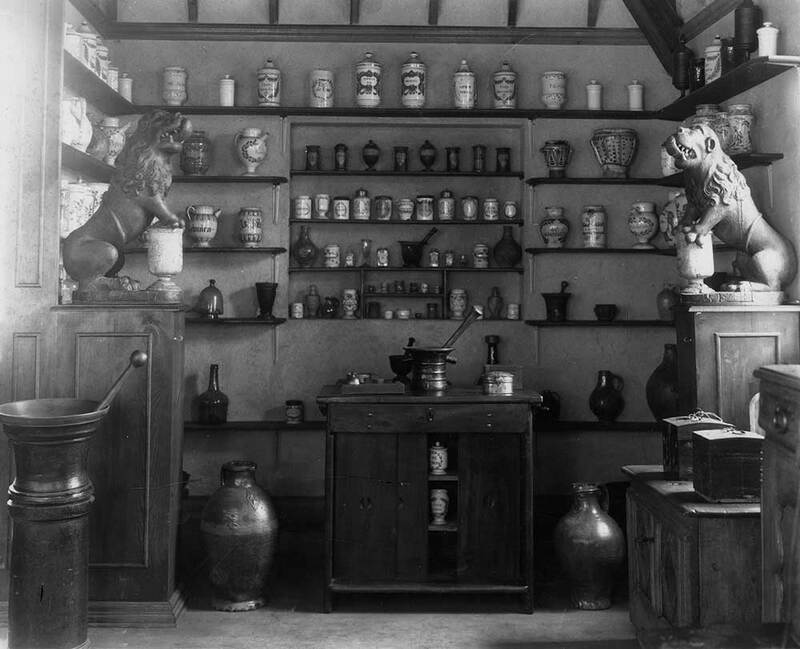 A view of the French apothecary installed at the MFPA in Gallery X, circa 1926-1935. From the Estate of Elie Nadelman. The MFPA opened to rave reviews, giving the Nadelman collection an international spotlight. As the genre continued to go mainstream, the Nadelmans got involved with La Commission Internationale des Arts Populaires, or the International Commission on Folk Arts, an organization formed by the League of Nations to promote the study of folk arts. The Commission officially launched in 1928 with Elie and Viola on its board, giving them even more power to steer the global conversation around folk art. Yet in 1929, while the MFPA was still finding its footing, the stock market crash altered the couple’s plans. Many of Viola’s long-term investments were destroyed, and the Nadelmans’ extravagant lifestyle became unsustainable. “When the Great Depression hit, they were really living the high life,” Olson says. “But Viola had most of her money in real estate, which, of course, evaporated with the stock market.” Within a few years, the Nadelmans’ international travels, multiple homes, and antiques-collecting habit quickly became extravagances they couldn’t afford. Viola and Elie had successfully stacked the MFPA board and advisory committee with some of the biggest players in the art world, such as Alfred H. Barr, Jr., Rene d’Harnoncourt, and Henry Francis Du Pont, but even they couldn’t save the sinking ship, particularly when the museum wasn’t located in the heart of New York City. In 1934 and 1935, the MFPA received a Carnegie Corporation grant to keep operating, after which the Nadelmans maintained more regular hours and dropped “peasant” from the institution’s name. However, in 1936, Carnegie declined to renew the funding because it was against their policy to provide ongoing support, which put the museum in a dire financial state. 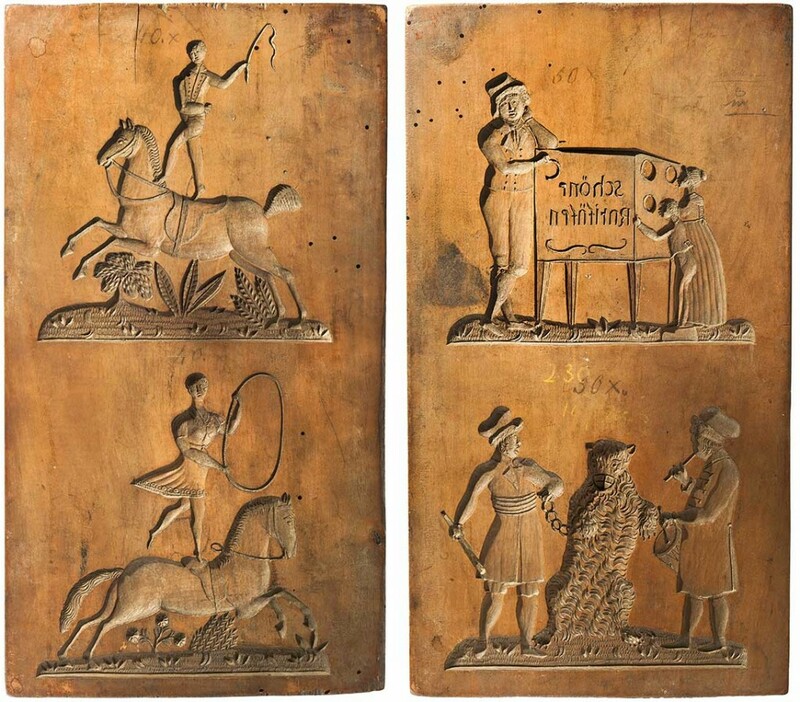 These carved wooden molds, circa 1800-1830, were used to make Tirggel, or traditional Swiss Christmas biscuits. From the collection of the New-York Historical Society, photographed by Glenn Castellano. By this time, Viola and Elie were discreetly selling off some of their artworks to help the museum stay afloat. Once it was clear this wasn’t a long-term solution, they started shopping the entire collection to potential benefactors who would keep it accessible to the public, such as Nelson A. Rockefeller. The Nadelmans initially asked art dealer Edith Halpert to sell their entire collection for $400,000 (or more than $6.5 million in 2016 dollars), a sum that was soon lowered to $350,000. But Halpert found that potential American buyers were turned off by the large contingent of European artworks. Finally, in November of 1937, the Nadelmans met with the N-YHS to discuss a potential acquisition. The Historical Society had just begun an expansion of its building on Central Park, and its board quickly voted to purchase the bulk of the Nadelmans’ collection for a mere $50,000 (or around to $824,000 today). After the transfer to the N-YHS, Elie was hired to curate and catalog the collection, while Viola stepped back completely from her previous role as director. “I think it was such a heartbreaker,” Olson says. “She needed to recalibrate. When you put all your emotions and energy into something and then you see it going away, you have to take a break. They both turned much more inward.” Despite the altered state of the Nadelman collection, it was now located in the heart of America’s largest city and accessible to thousands more people each year. Not long after, the original MFPA building in Riverdale was torn down. Today, a century after the Nadelmans legitimized the study of folk art, scholars are still parsing the term’s implications. “In a sense, it’s gone mainstream,” Olson says. “But it depends on what you call folk art, and that’s part of the conundrum about all this. I don’t know the answer—the Nadelmans would’ve said if it was made by hand, was aesthetically appealing, and showed craftsmanship, it was folk art. They cherished and celebrated that; it’s what the Museum of Folk and Peasant Arts was all about.” However, at a time when major art museums mount exhibitions of graffiti and street art, the designation “folk art” seems increasingly dated and unnecessarily limiting. Maybe it’s time we just call it art. This Calligraphic Horse was drawn by a student to show penmanship, circa 1850. From the collection of the New-York Historical Society, photographed by Glenn Castellano. Fascinating read, Hunter! I enjoyed it. Loved the article. I’m a big fan of folk art but didn’t know about the Nadelmans (great couple!). Definitely agree that it is a term nearly-impossible to define satisfactorily. It does seem there needs to be a disconnect between the untrained artisans who strive for technical perfection (but come short) and the later critics who take these honest but naïve pieces and praise them FOR those very “imperfections.” A common theme which binds graffiti and folk art (in contrast to “fine art”) is that it is always a personal statement, impossible to mass-produce and never intended for elitist collectors or museums. Art by the people for the people. “ ” There were the Beatles, 16 feet tall, walking across Abbey Road in my backyard.